This is an unusual curry with a lovely spicy finish. It’s peppery sauce has a kick that just keeps on giving. So if you like a bit of spice then you’re going to love this! There’s a lot of sauce too which is great for soaking up with lots of fluffy rice or bread. 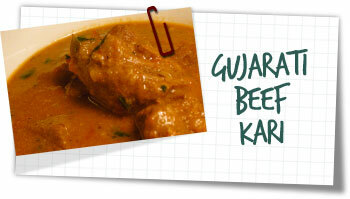 Interestingly, Gujarati food is typically vegetarian but there are meat dishes throughout the region including this delicious beef recipe. You can also make this curry using lamb or goat. To make the spice mix, dry roast all the ingredients in a small pan for 1-2 minutes until aromatic. Cool then grind everything together in a pestle & mortar or with a spice grinder until a fine powder is formed. Mix together with 600ml warm water and set aside. Heat the oil in a large pan over a moderate temperature. Drop in the cinnamon stick, cumin seeds and curry leaves, sizzle for 30 seconds then add the onions. Fry for 5 minutes then add the garlic, ginger and chillies. Stir for 1 minute then add the beef. Stir for 1 minute then put on a lid and reduce the heat to medium low. Cook for 10 minutes stirring occasionally. Pour in the spice mix and tomatoes and 1 teaspoon salt and stir well, turn up the heat and bring to a simmer. Reduce the heat to low and simmer gently covered stirring every 15 minutes for 1 1/2 hours until the beef is tender. Add the coconut milk and simmer uncovered for a further 30 minutes, stirring occasionally. Stir in the coriander and lemon juice and the remaining salt if you think it’s needed just before serving. Serve with plenty of basmati rice to soak up the plentiful sauce.